In 1985, Steve McCurry photographed an Afghan girl for the National Geographic. The intensity of the subject's eyes and her compelling gaze made this one of the most widely and consistently celebrated portraits in the history of contemporary photography. This image accompanies the other remarkable faces he has encountered whilst travelling throughout the world, collected together in an engaging and moving series of unique street portraits: unposed, unstylized images of people that reveal the true universality of the depths of human emotion. 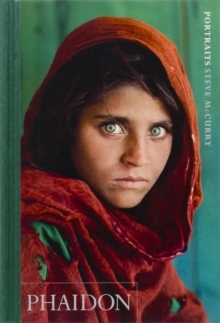 This fresh new edition, expanded to feature more photographs than before, including some never-before published, creates an up-to-date and unrivalled collection of McCurry's portraiture. Critically acclaimed and recognized internationally for his classic reportage, over the last thirty years he has worked on numerous assignments, travelling extensively throughout the Middle and Far East. A regular contributor to many international journals, McCurry is a member of Magnum Photos and a recipient of the Robert Capa Gold Medal and an unprecedented four World Press Photo first prizes in a single year; many of McCurry's images have since become modern icons. He is most famous for his evocative color photography, which has captured stories of human experience that, in the finest documentary tradition, transcend boundaries of language and culture.